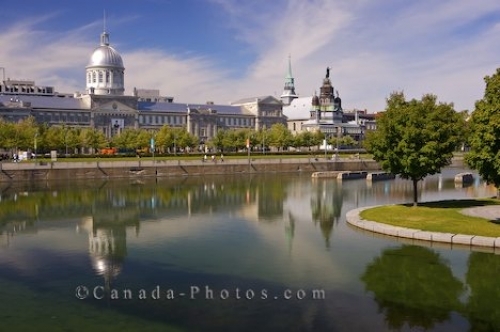 From the Bonsecours Basin in Montreal, Quebec in Canada, one can look across to the waterfront buildings which house the Bonsecours Market or the Marche Bonsecours and the Notre-Dame-de-Bon-Secours Chapel. These heritage buildings show off some of the most stunning architecture in Montreal city, Quebec which are situated in the centre of many of the most important tourist attractions. The Bonsecours Market is home to restaurants, galleries, boutiques, market stalls and many different exhibits which attracts many visitors. The beauty of the Notre-Dame-de-Bon-Secours Chapel has beautified this waterfront when construction began in 1657 and is a prominent landmark in Montreal, Quebec. Picture of the waterfront tourist attractions from the Bonsecours Basin in Montreal, Quebec in Canada. ... , Montreal, Quebec, Canada.